Can Wine School Lead to a New Career? Curious about formal wine education, Lettie Teague enrolls at a Napa school—and finds herself among a group of career changers eager to make a living by drinking. Anyone who has a job right now is probably trying to figure out how to keep it. Anyone who’s lost a job is probably trying to figure out what else he or she can do. Some people have told me they’re considering getting into wine as their next career move. After all, they reason, everyone is still drinking wine, even if it’s a cheaper kind. Yet unlike, say, business school or law school, there hasn’t always been a place to study for a career in wine. I know this from firsthand experience: Once upon a time, I wanted to be in the wine business, and I forged a path by trial and error (more of the latter and less of the former, alas). I sold wine both retail and wholesale and even did a bit of wine PR and marketing before I turned to wine writing full-time. And though I’m happy with the way things turned out, I wonder if things might have been easier had the Rudd Center existed (way) back then. The Rudd Center for Professional Wine Studies, at the Culinary Institute of America in Napa Valley, California, launched seven years ago. Students can take three- to five-day courses to earn certification as wine pros or shorter seminars on topics like rosé. The class that interested me the most was the four-day Discovering the Professional World of Wine, which promised to give “the inside scoop on all that goes on in the world of wine” for only $895. Curious about what students might learn to set them on a new career path in only four days, I decided to investigate. “If this course were more than four days long, I’d run out of things to say,” joked instructor Jeff Morgan at the start of the first day. According to the program we received, the course would cover viticulture, winemaking and food-and-wine pairing, as well as the business side of wine. Jeff (whom I’ve known since he lived in New York more than a decade ago) seemed singularly well-suited to teach such a class. He started out as a professional musician but switched to wine writing after too many late nights and too much traveling for gigs. He’d made a brief foray into retail sales as the wine director of Dean & DeLuca in Napa, and he was now a winemaker and a wine educator, dabbling in cookbooks on the side. Our class was held in one of the two large rooms (a.k.a. 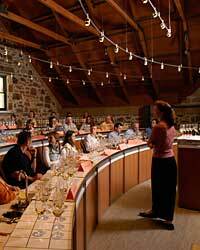 “tasting theaters”) at the Rudd Center, a small stone building that was part of a winery a century ago. Both rooms had stadium-style seating that evoked theater less than they did science class. There were sinks and light boxes (to better observe the color of the wine in the glass). In the time-honored tradition of the first day of school, Jeff had each of us introduce ourselves in turn. There were 15 students, including me. 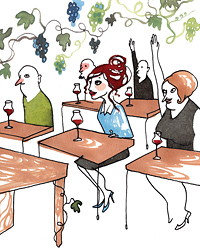 Some just wanted to learn more about wine for fun, including two women from Wyoming and a TV-commercial producer from L.A. A few had career goals: A biochemist from Berkeley was hoping to channel her knowledge of soil into a viticultural job, and a few women hoped to open a wine bar. “I figure people will always drink wine, even in a bad economy,” said Julia, who lived in the East Bay near San Francisco. Julia was one of several students who had recently been downsized out of their jobs. But another student named Brenda, dressed in business attire, had just taken a job selling wine in Southern California. She decided she needed to know more about wine: “Eventually, I’ll run into someone who asks me a tough question,” she said with enthusiasm. She and her husband, who was sitting next to her, hoped to buy a winery one day. “We almost bought one in Amador County that was in foreclosure, but someone beat us to it,” Brenda’s husband said. One of Jeff’s earliest lectures was devoted to viticulture. He explained that the first step in understanding how wine is made is knowing how grapes grow. Although he doesn’t own vineyards, Jeff produces a fancy kosher Cabernet, Covenant, in partnership with Leslie Rudd of Rudd Vineyards & Winery. (Leslie Rudd helped fund the creation of the wine center.) Jeff’s own winery produces SoloRosa, a rosé. As he said with characteristic self-mockery, “I can talk about winemaking from a personal perspective. I have personally screwed up wines several times.” He outlined the basics of viticulture at a rapid clip: how a grape develops and ripens, how vines mature, how vines in a vineyard are spaced and trellised. Then it was time for a field trip to a vineyard. We loaded into a van, and the driver took us a few leisurely miles, stopping at a scraggly vineyard opposite a tennis court. “This is the famous Hayne Vineyard,” Jeff announced. The class blinked in the bright sun. A woman wearing red patent leather high heels teetered in the dirt as she bent to get a closer look at the gnarled old vines. “The fruit from this vineyard is some of the most expensive Zinfandel in the Valley,” Jeff announced, explaining that Turley and other prestigious wineries bought these grapes to make high-priced Zinfandels. What about the nearly identical vineyard across the street? the teetering woman asked Jeff, who didn’t think it had a name. “But you can probably buy the fruit for a lot less,” he said. Anonymity comes with a bargain price tag in Napa, it seemed. Jeff pointed out the aspect of the vineyard (“east- facing”) and the different trellising systems—ways of training a grapevine to grow along a support, usually a wire, in order to determine the placement of the canes (slender branches) and the cordons (thicker sections of the vine). “That’s a cordon-pruned vine,” he said. “And that’s cane-pruned.” There are various reasons growers choose one method over another, often depending on the type of grape or vineyard site. Joycelyn, a former engineer who hoped to export wines to her native China, picked a bit of vine off the ground that had been left behind by the pruners. “Is this a cane?” she inquired. Jeff nodded. It was a question he fielded several more times; the class seemed keen on trellising systems. 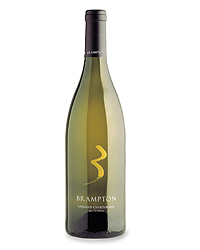 I pictured Brenda dazzling a customer with her freshly acquired viticultural savvy: “You know, that Chardonnay comes from a west-facing, cane-pruned vineyard.” She’d probably sell at least five cases of it. The next topic the class tackled, learning how to talk about wine, seemed more obviously useful to an aspiring wine professional. In fact, it was so important that Jeff had given the process acronyms, BAT and AFF: Body, Acidity, Texture and Aroma, Flavor, Finish. The words used to describe each were critical, Jeff told us. “Your choice of words will really affect the listener,” he cautioned. He recommended avoiding other words too. For example, “oaky” is almost always pejorative, he said. “If you wanted to be kind, you would say ‘toasty.’ ” What about “fruity”? someone asked. What about “sweet”? What about “mellow”? “No, ‘mellow’ is more of a personality trait,” Jeff said. Some students had a hard time understanding the concept of corkiness. Its effects can range from a subtle suppression of a wine’s fruitiness to an aggressive aroma of moldy basement or wet newspaper. “I see people looking at the corks in restaurants,” Brenda’s husband said. “When a wine is corked, can you see anything on the cork?” There are no visible signs, Jeff informed him. Our tasting that day featured seven wines (including Jeff’s own rosé and a Gewürztraminer) and plain chicken served with various sauces (aioli, mole, pesto, romesco and spicy peanut). This exercise demonstrated pairings that worked because they were complementary (the flavors in the wine matched those in the food) versus ones that succeeded because they were contrasting. Jeff kept score on the blackboard. Although this tasting was intended as a professional inquiry, it seemed to be more about having a good time— especially since the class was now allowed to drink the wine instead of spitting it out. Charlie particularly enjoyed the exercise. “This is so much fun. You always see sommeliers and chefs sitting around doing this; I feel like one of those guys,” he exclaimed. The last day’s lesson was the most revealing for Jeff, professionally and personally, since he presented his own winery as a case study. “We’ll discuss what goes into starting a winery, and I’ll use my own SoloRosa as the model.” He paused for effect. “And I’ll explain why we are going out of business.” Jeff was kidding, of course—SoloRosa is still very much in business—but the class gave a collective start. “Have you tried trade shows where you could sell your wines?” Brenda suggested. “How about getting Robert Parker to taste your wines?” offered one of the Wyoming women. “Did you think about a celebrity endorsement?” asked her friend. I was as impressed with their willingness to tackle Jeff’s problems as I was with their understanding of the marketplace. Except they were wrong—at least, according to Jeff. “The best way to sell wine is to make a big splash in the media, so that the public, the buyers and the distributors are aware of the wines,” Jeff replied. “The best advantage any wine has is editorial coverage. And certain magazines matter more than others.” He shot me a meaningful look; the class followed his gaze. Jeff’s future, it seemed, was squarely in my hands. “I’ve always been suspicious about why some wines get written up,” a woman from Wyoming said. I gave her an innocent smile. Charlie took a sunnier view: “There must be some young guy tasting all the wines that Parker doesn’t,” he laughed, clearly wishing he were that guy. “I sent a bottle of SoloRosa to Eric Asimov at the New York Times once,” Jeff offered. “He gave it one star and said it had elements of cardboard. He was describing a corked wine! My distributor asked, ‘Why did you send him a corked bottle? You would have been better off not sending him anything at all.’ ” The class laughed sympathetically. I was beginning to think of Jeff as the Rodney Dangerfield of wine—with an extremely unreliable source for his corks. But when Jeff detailed the cost of producing 1,000 cases of a hypothetical wine versus the profits, the mood grew somber. Add in the expense of corks, bottles, labels, barrels, lab work, storage, shipping and sampling, and the total cost of producing 1,000 cases came to $107,000— versus just $90,000 in sales. A loss of nearly $20,000. “You don’t go into the wine business if you want to make money,” added Jeff, unnecessarily. Right now, he said, he was happy that his wine sales paid for his health insurance. “What about starting a wine club for SoloRosa?” Brenda suggested. There was no question that she had the persistence of a successful salesperson. “It’s kind of hard to have a wine club when you only have one wine,” Jeff replied rather dourly. This was a good time for a break: a visit to Enoteca Wine Shop, a small store in nearby Calistoga. Enoteca is owned by Margaux Singleton, an arts administrator–turned–wine retailer who had come to Napa from New York, by way of New Mexico. Her store is painted in a fun trompe l’oeil style to resemble an old wine cellar, and her selections are intriguing and quirky; it’s one of the few wine shops in the country where I’ve seen Chateau-Grillet, a rare white Rhône made in tiny quantities. The class was encouraged to ask Singleton about how she got started as a wine retailer, though Jeff pretty much narrated her life story himself. Here was someone the class could identify with, who had transformed her love of wine into business success. The first pair of wines we tried were whites, and the second one was clearly superior: I thought it was much richer and more substantial. Most of my classmates preferred the first wine. Jeff unveiled the bottles—the first was a Two Buck Chuck (a.k.a. Charles Shaw) from Trader Joe’s, the second a 2006 Ramey Russian River Valley Chardonnay from a top California Chardonnay producer. The class gasped. In the next two sets of wines, my classmates correctly identified (and preferred) the expensive wines both times (the 2003 Stolpman Syrah over the 2006 Cline Cool Climate Syrah, and the 2006 A. Rafanelli Dry Creek Valley Zinfandel over the 2006 Ravenswood Vintners Blend). Their tasting notes, which they read aloud, were impressively detailed, with specifics about structure, tannins, acid and fruit, all following Jeff’s BAT-AFF writing structure. Except for Charlie, who said of the Rafanelli, “The whole bouquet is more put-together.” “Come on, Charlie, on day four you can do better than that,” Jeff replied good-humoredly.